Over 150 require medical assistance during 25 hour fast in midsummer heat. 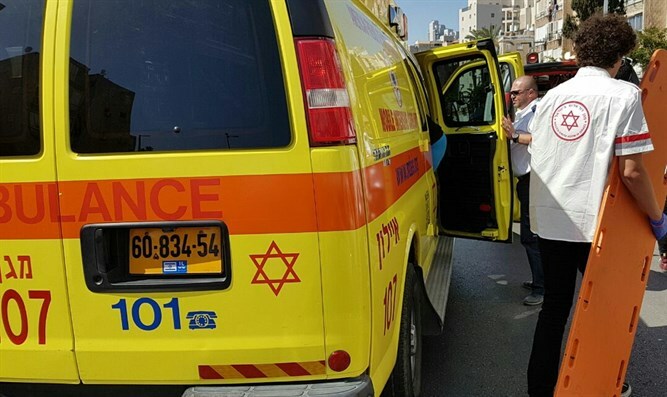 Magen David Adom announced Tuesday evening that its paramedics had treated 168 people during the Tisha B'Av fast day. 96 cases involved weakness, dizziness and confusion, 66 people fainted, and six cases involved severe dehydration. The weather was hot and muggy during the fast. Temperatures reached 38 degrees Celsius (100.4 degrees Fahrenheit) in Kiryat Shmona, 33 (91.4) degrees in Tzfat, 32 (89.6) degrees in Haifa and Tel Aviv, 33 (91.4) degrees in Jerusalem, and 36 (96.8) degrees in Be'er Sheva. As in previous years, the MDA issued guidelines to the fasting public on how to prepare and conduct the fast to prevent any medical incidents. MDA units, including ambulances and motorbikes, were deployed to insure a speedy response in the event of a medical emergency at places where many fasting people gathered, such as the Western Wall. The Tisha B'Av fast, which takes place annually on the ninth day of the Hebrew month of Av, commemorates the destruction of the two Holy Temples by the Babylonian and Roman empires in 586 BCE and 70 CE, respectively. Religious Jews refrain from eating and drinking for a 25 hour period of mourning. They also refrain from wearing leather shoes and bathing and do not sit on anything higher than a 1-foot high stool until midday. They do not greet one another on the eve of the fast and there is no Torah study because that gladdens the heart. It is recommended to break the fast with a light meal. Start with a lukewarm drink (not too hot) accompanied by a simple piece of cake or two slices of bread with cheese. Eat a light meal about an hour after breaking the fast. MDA Director-General Eli Bin said: "Every year, MDA teams provide rapid and quality treatment to those injured as a result of the oppressive heat during the fast. I am glad that no severe cases were recorded and most of the cases were treated on-site, which indicates that the fasting individuals are alert to their medical condition. I remind the public to call the 101 emergency call center for any medical need. "